Serves 4. All natural. Farm-fresh goodness. Made with: fresh Russet potatoes; real milk & butter; no artificial flavors, colors, or preservatives. America's No. 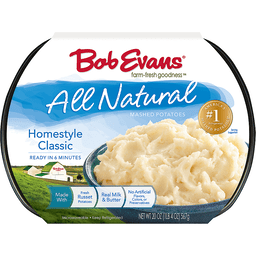 1 refrigerated mashed potatoes (America's No. 1 refrigerated mashed potatoes claim is based on IRI scan sales data, total US, for the year ending 1/24/16. (Please note this is not an expiration date)). Microwaveable. www.bobevans.com. Gluten free. Farm fresh ideas. Recipes. Tips. Tricks. Visit bobevans.com/recipeclub to sign up! Facebook. Instagram. Twitter. Pinterest. 1/4 pound patties. US inspected and passed by Department of Agriculture. Quality control USDA approved. Looking for meals your whole family will love? 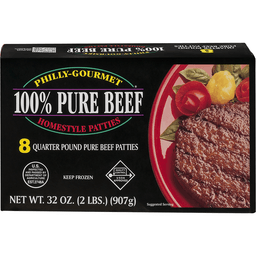 Our mouthwatering Philly Gourmet 100% Beef Patties are incredibly juicy, amazingly delicious and outrageously easy to prepare! Money back guarantee. If you are not satisfied, please state why and mail proof of purchase seal, along with the price paid, to: Philly-Gourmet Meat Co., PO Box 350, Shillington, PA 19607-0350. Your money will be promptly and cheerfully refunded. For more information and recipe ideas visit our website: www.philly-gourmet.com. The above Nutrition Facts am for the product as consumed, one cooked patty, and are based on the following cooking instructions: Place frozen patty on a 350 degrees F grill or frying pan for about 9 minutes per side for a total of 18 minutes. Beef patties should be cooked to a minimum internal temperature of 160 degrees F (71.1 degrees C). Pinterest. Facebook. Instagram. Farm-fresh goodness. Now improved! More flavorful, better tasting! Oven-baked taste in minutes! Made with real cheddar cheese. Microwaveable. Serves 2-3. Bob Evans 1918-2007. Farm-Fresh Goodness Pledge: Bob Evans opened his first sausage shop near his Ohio farm in 1948. He used the finest ingredients and set a standard of excellence. To this day, with over 500 restaurants and more than 100 grocery products, the Bob Evans brand lives up to the standard started over 60 years ago. If you are not completely satisfied, please contact us for a replacement or refund. 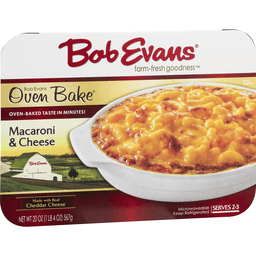 For more information, please visit www.bobevans.com/guarantee. www.BobEvans.com. BEmail by Bob Evans: For big savings from Bob Evans, sign up at www.BobEvansEmail.com. 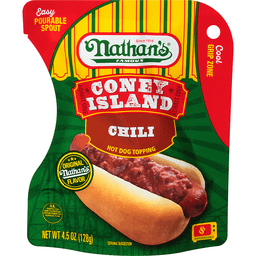 Nathan's® Famous Hot Dog Topping Chili. Since 1916. Original Nathan's® flavor. U.S. Inspected and passed by Department of Agriculture. Microwaveable. Net Wt 4.5 oz (128 g). Under license from Nathan's Famous Systems, Inc. Visit: www.nathansfamous.com. 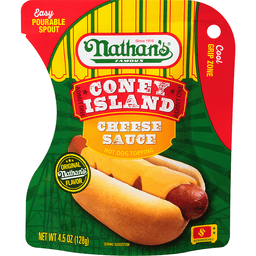 Nathan's® Famous Coney Island Hot Dog Topping Cheese Sauce. Since 1916. Original Nathan's® flavor. Microwaveable. Net Wt 4.5 oz (128 g). Under license from Nathan's Famous Systems, Inc. Visit: www.nathansfamous.com. Serves 4-5. Sweetened with apple cider & real sugar. Farm-fresh goodness. Microwavable. www.Bobevans.com. Farm Fresh Goodness Pledge: Bob Evans opened his first sausage shop near his farm in Rio Grande, Ohio in 1948. He used only the finest ingredients and set a standard of excellence. 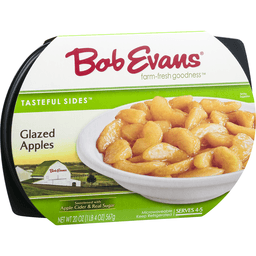 To this day, every Bob Evans product lives up to the standard he started over 60 years ago. If you are not completely satisfied with this product, please contact us for a replacement or refund. For more information, please visit www.bobevans.com/guarantee. Product of USA. 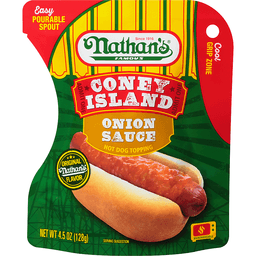 Nathan's® Famous Hot Dog Topping Onion Sauce. Since 1916. Original Nathan's® flavor. Microwaveable. Net Wt 4.5 oz (128 g). Under license from Nathan's famous systems, Inc. Visit: www.nathansfamous.com. ©2019 Stager's Store. All rights reserved.